I found this pattern on the Wedding Dress Blue blog under the Calico Rose quiltalong tab at the top of the page. The quilt done in whites and scrappy fabrics didn’t interest me but I could imagine bright scrappy fabrics twinkling on a black background. I’m glad to say the finished quilt exceeded my expectations. I’ve been working on this for way too long but with the thanks of my fiance Marc it finally got it quilted and after some brutal (black binding on black fabric is no fun to sew at all!) binding sessions getting all 30′ of binding completed, it’s finally on our bed! And we are absolutely loving it! It is beautiful! Thanks for sharing with Oh Scrap! Gorgeous!!! What a beautiful finish. I love it! 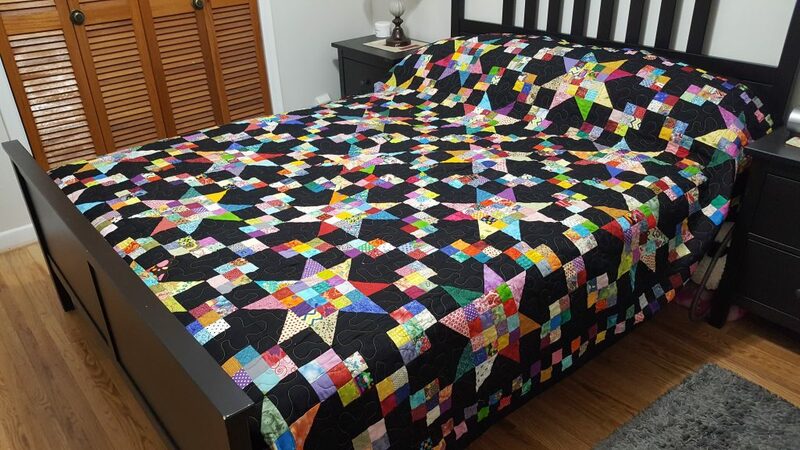 Quilts with black fabric are just lovely. As far as scrappy quilts go…this is up at the top! The colors are very striking against the black fabric. Hand stitching black on black requires a very bright lamp…it isn’t easy! But in spite of all the wait and the pain you did it!!! And it is a gorgeous finish. You should be so proud of it. The black background makes the scrappy stars shine brightly! I can see why you love it – you have a beautiful quilt! I really like the black background. It makes those colors just pop! Congrats on powering through all that binding and finishing your quilt. Thanks so much for sharing it on MCM! You are so right! The black really sets it off beautifully! What a beauty this one is!